A comparative study is presented on the solid-phase peptide synthesis (SPPS) of the acyl carrier protein (ACP 65–74) sequence on a series of Rink amide resins possessing different matrix structures: poly(vinyl alcohol)-graft-poly(ethylene glycol) (PVA-g-PEG, 4), Tentagel-S-RAM (TG, 5), NovaGel (NG, 6), ChemMatrix (CM, 7) and polystyrene-divinylbenzene (PS-DVB, 8). In this comparison, the PEG-containing resins proved significantly better suited for the synthesis of pure ACP target sequence than the conventional PS-DVB solid supports (75–90% versus 52% crude purity). 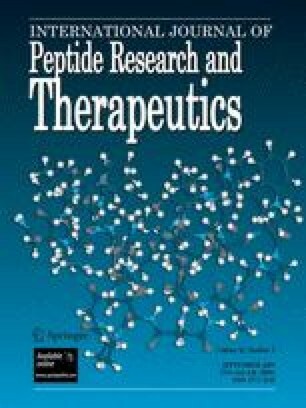 Amongst themselves, the PEG resins 4-7 exhibited similar capacity for providing pure peptide. Selecting PVA-g-PEG resin for a comparison of Rink amide linker versus no linker, the ACP (65–74) sequence was synthesized directly on the PVA-g-PEG resin 1, under identical conditions as employed in the synthesis on resin 4 bearing the Fmoc Rink linker, except for the final cleavage step, which was performed under more environmentally sound conditions using ester displacement with aqueous ammonia. Relative to its Rink amide counterpart 4, PVA-g-PEG resin 1 was cheaper to produce and possessed twice as much loading capacity (0.48 vs. 0.81 mmol/g). Moreover, Rink-less resin 1 gave higher yields of isolated pure peptide (61 vs. 45%) relative to its Fmoc Rink linker counterpart 4. In light of these results, the importance of the linker has been brought into question. As the need for large scale solid-phase peptide synthesis grows with greater demand for peptide products, ideal resins should be inexpensive to produce and employable under environmentally sound conditions to provide pure products. In this light, PVA-g-PEG resin 1 has demonstrated significant promise for economic and “green” SPPS. Financial support from the Natural Sciences and Engineering Research Council (NSERC) of Canada and the Canada Research Chair program is greatfully acknowledged. The authors also wish to thank Marie-Christine Tang and Dr. Alexandra Furtos for their help in the LCMS analyses of the peptides synthesized in this study.